Dungeons & Dragons has some of the best fans in the world, and because of you, 2016 was one of the biggest years ever for the brand. Enormous thanks to our players and supporters. You’re awesome! 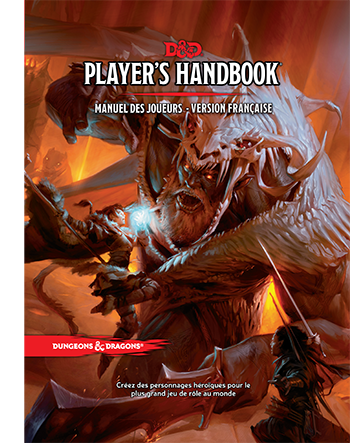 Today, we’re announcing an exciting step in making sure other D&D fans around the world can enjoy fifth edition as well. Wizards of the Coast has partnered with Gale Force Nine to localize Dungeons & Dragons fifth edition tabletop RPG content into multiple languages. They will start with the Player’s Handbook, Dungeon Master’s Guide, Monster Manual, and the D&D Starter Set, as well as accessories created by Gale Force Nine (such as spell cards and Dungeon Master’s screens). The first translations will be French, German, Italian, Japanese, Spanish, Polish, and Portuguese, with more to follow. We want fans to know that we’ve heard you asking for translations for a long time, and recognize that in previous editions there have been many different translations for the core books. So why has it changed this time around? Our approach for this edition has been different from the beginning—starting with the playtest, then moving on to our focused approach to published content, and providing the OGL for fifth edition while also supporting an online community to share created content in the DMs Guild. It’s because of our philosophical changes that our approach to translations has also been different. We decided that simply getting the books out in local languages wasn’t good enough. We also wanted to make sure that the quality, consistency, care, and community support that have made fifth edition so popular in English also exists for other languages. We have been working closely with Gale Force Nine since the launch of the edition, so we know they understand our commitment to quality and consistency. With this partnership, Gale Force Nine will be responsible for translations of physical products and for overseeing the production and local market partnerships necessary to support the hobby. By working with language experts, printers and D&D fans in each country, we are confident in their understanding of the unique issues facing each market. While we haven’t announced exact details for each market, the general plan is that products for these initial languages will be available sometime this summer on a staggered roll-out occurring over three months. Additional translations of other supplements or future campaign books will follow the English releases as closely as possible, but may vary by market or language. While this announcement doesn’t include all of the languages that we’ve translated into in the past, we know Gale Force Nine is dedicated to meeting market needs and supporting our fans. Q: Why have you chosen Gale Force Nine instead of working directly in each country? A: Partnering with just one licensee on the program ensures a more consistent roll-out across all other languages as well as a dedicated team in the U.K. working closely with translation teams and European printers. Q: Will translated products be for sale at my friendly local game store? A: The distribution varies by country, but for the most part your local hobby shop and book channel stores should have access to Dungeons & Dragons products at prices comparable to current U.S. and U.K. products published directly by Wizards of the Coast. Q: How do people in each market find out more? A: As part of this release, we will be directing people in each of the markets to our local distribution partners and their websites to find out more. This information will also be on the Gale Force Nine site.